In small bowl, stir together cheese, nuts, brown sugar, lemon juice, and zest. In shallow bowl, whisk together egg substitute, milk, vanilla extract, cinnamon, and ginger. 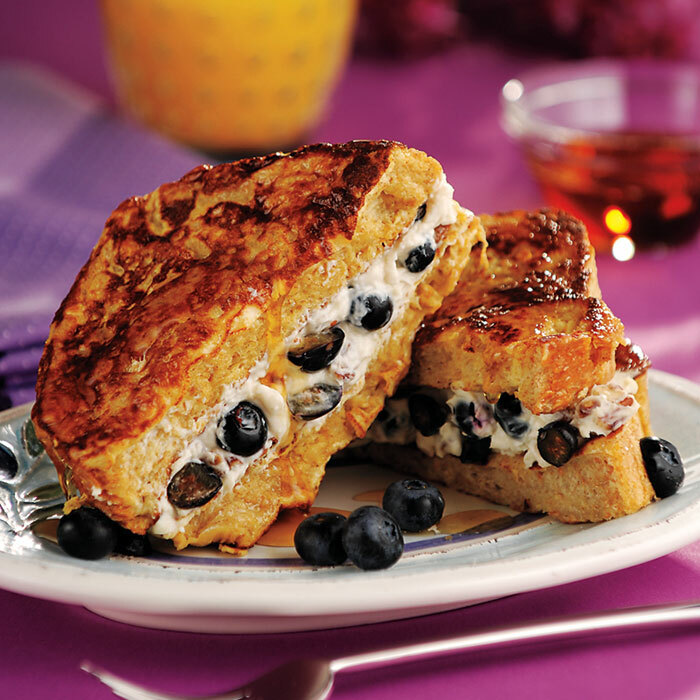 Spread 1 side of 4 slices of bread evenly with cheese mixture; sprinkle blueberries in single layer over cheese mixture. Lightly press remaining bread slices over blueberries to close. Spray large skillet or flat top griddle with nonstick cooking spray. Preheat skillet over medium heat 2 minutes. Briefly soak both sides of bread sandwiches in egg mixture, then place in skillet. Cook 6 to 7 minutes or until golden brown, flipping once with large spatula. To serve, cut French toast in half and drizzle with syrup.